A burning ridge. Gills of flame in the dark. Smoke rises; ashes sink. 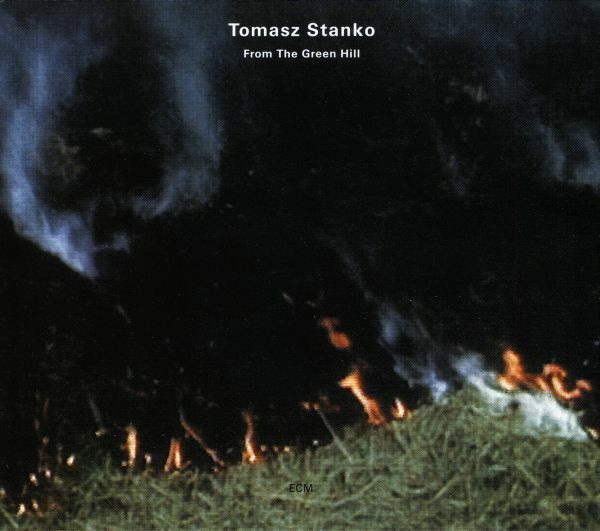 This is the visual manifestation of all that resounds From The Green Hill, yet another leap of profundity from Tomasz Stanko after the Polish trumpeter’s four-album ECM panorama. To achieve this, he couldn’t have asked for a more appropriate band: John Surman (dipping into his characteristic low reeds), bandoneón maestro Dino Saluzzi, violinist Michelle Makarski, bassist Anders Jormin, and drummer Jon Christensen decode the cover photograph as a meta-statement of Stanko’s bite and his underlying deference to the spirits lurking within his instrument. Of those, the ghost of Krzysztof Komeda opens its mouth most widely and unleashes its lachrymose glow at 24 frames per second in two versions of “Litania.” Saluzzi plays each alone, keying from them a vital thematic thread of Stanko’s sound-world, a floating lily with no destination but its will to bloom. Saluzzi thus adopts a narrative voice, without which the story would lack a vital organ. Surman contributes the album’s frame tale in the form of “Domino,” which opens the set and also makes a penultimate reappearance. In the former incarnation, it constitutes a viscous introduction in which the free considerations of the band’s rhythm section (to which the bandoneón is bonded) are the matchbook strip to Stanko’s strike. “Stone Ridge,” also by Surman, puts his bass clarinet in the spotlight. Flowering from a solo violin before Stanko’s muted strains pull up the others in his net, the ensuing groove gives plenty of hooks for its chain of soliloquys, of which Makarski’s is utterly remarkable. The compositional skin that keeps this all embodied is writ large by Stanko, despite the fact that he seems relatively absent. What he lacks in airtime, however, he makes up for with a honed improvisatory laser that etches every nook of this shadowy house in which we find ourselves. It all reaches a nadir in “Love Theme from Farewell to Maria” and in the title track. The level of attunement to every change in both offers hope against the somber charge. Not to be ignored, Jormin stands out for his restless solo in “…y despues de todo” and for the inversions of “The Lark In The Dark.” Christensen’s drumming, too, with its microscopic and sparkling current, sets off a halting sort of poetry. (Note also his free talk with Saluzzi in “Buschka.” Brilliant.) We end in “Argentyna,” which confirms the presence of a magnifying glass in Stanko’s Swiss Army knife, though with no loss of intensity—if anything, more of it. Stripped to the core of their melodic undertaking, his powers of recollection gnaw at the arbitrariness of intellectual border zones. His are not cerebral toys, but direct methods of communication, their raw rubato the touchstone of an unrelenting lyricism…and all of this with hardly a trace of aggression. The genesis of From The Green Hill can be traced back to ECM’s May 1997 Whitsun concerts at the Hotel Römerbad in Badenweiler, Germany. It was there that Stanko found himself performing at the behest of producer Manfred Eicher, who dropped his weight into new and exciting pools. Several performances and one all-night jam session later (oh, to have been there…), we arrive in this masterfully interwoven place, where ebb and flow have only one name: you.